A porcelain laminate veneer is a thin layer of dental ceramic material that is fixed to the outer surface of a tooth with a special resin adhesive. Veneers essentially replace tooth enamel. They enhance teeth cosmetically by masking a variety of minor to moderate dental imperfections. Working with dentists to pick an appropriate shade of porcelain, dental technicians can skillfully replicate natural enamel. 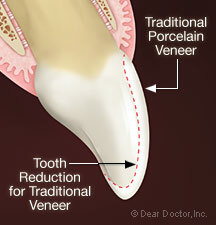 Veneers do not stain the way teeth do, and can last seven to 20 years or even longer. That's because porcelain is hard, strong, durable, translucent in an attractive, glass-like way, and highly resistant to chemical attack. What Is the Process of Restoring Teeth with Veneers? If your dentist determines you are a good candidate for veneers, you can expect the process to take about two to three visits (including the initial consultation) over one to three weeks depending on whether the dental laboratory is in-house or not. The best way for your dentist to begin the process of designing your new smile is to create a model of your teeth, and then use it to make a provisional set of veneers out of plastic. You can actually wear these for up to two weeks to see if you like the effect. Once you and your dentist agree on the form and the shade of your veneers, specifications are sent to a dental laboratory. There, skilled technicians will mix porcelain powder with water, form it around a mold of your teeth, and bake it in an oven. Several layers are built up to mimic the translucency of real enamel. Before the veneer is bonded to the tooth, a small amount of the tooth's surface — 1 mm or less — is usually removed in a process known as reduction. This often requires local anesthetic. There is, however, a relatively new procedure requiring no tooth reduction, referred to as the no-drill or prepless porcelain veneer. While veneers are most effective with minimal reduction (also called minimal prep), prepless veneers have the advantage of being reversible. But they are not appropriate in all situations. There is no substitute for your dentist's talent and expertise in the various cosmetic techniques and materials. These skills — combined with a clear understanding of your goals and a diagnosis based on a thorough evaluation — are critical to assure the successful result of a beautiful smile. Porcelain veneers are strong enough to withstand normal flossing and brushing with any non-abrasive fluoride toothpaste; they should be cared for in the same manner as completely natural teeth. However, porcelain is a glass and like all glass, veneers can shatter if bent. Within reason, you can eat almost anything with veneers, but you wouldn't want to crack nuts against them or chew on bones. And if you grind your teeth at night, you may need to wear a night guard to protect your veneers. Selecting a cosmetic dentist for the creation of your new smile requires an ability to evaluate a dentist's ability, the years of experience, whether he stands behind his work, his personality, his philosophy of care as well as his training in the area of cosmetic dentistry. He/She should be able to provide you with many examples of before and after results of treatment to see the work he/she has performed for others. A study of his training in this area is something he should be proud of and very easily provide for your evaluation. The reason cosmetic dentistry requires a significant investment of dollars is related to the fact that the cosmetic dentist is creating a work of art that you will showcase for a very long time every time you smile. Research is important before making the selection of which cosmetic dentist should do this work for you. Communication between you as the patient, your dentist and the laboratory technician are critical to the process of providing the best possible smile enhancements to meet your expectations. Research has shown that there are differences between individuals' perceptions and those of dental professionals regarding not only teeth but other factors affecting smiles and facial appearance. The use of a special blueprint such as a “provisional restoration” is a useful tool to help envision potential changes before they are truly finalized to ensure the most aesthetic and functional result for achieving your vision. Now the person in the mirror really can be the true you. Every technique has limitations and that is why a talented and experienced cosmetic dentist is required to evaluate what material or restoration is best for your individual circumstance. Experience will allow him or her to determine whether or not porcelain veneers are the treatment of choice as porcelain veneers do have limitations. Find a Cosmetic Dentist today that offers porcelain veneers or learn more about Cosmetic Dentistry.